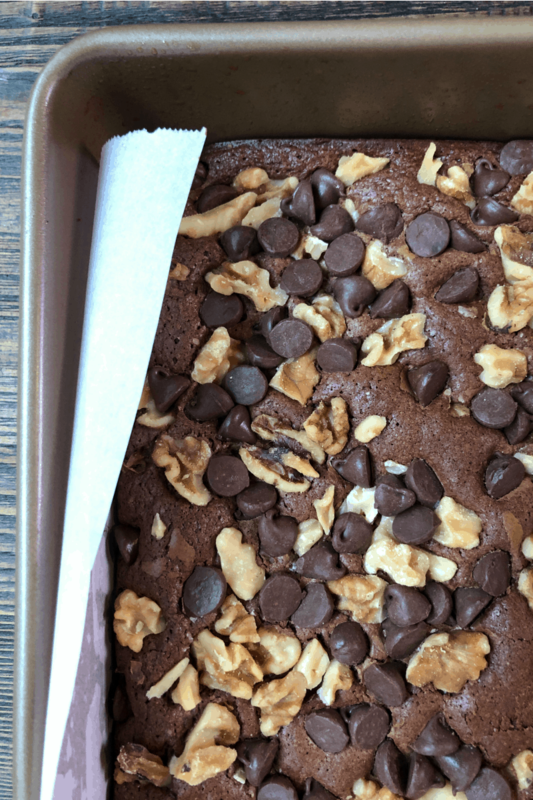 These Chocolate Chip Walnut Brownies are packed with chocolate flavor and plenty of crunchy walnuts. These brownies are awesome because they’re just full of everything good. Picture a really good brownie recipe. Then picture a ton of chocolate chips and chopped walnuts being sprinkled on top before baking. 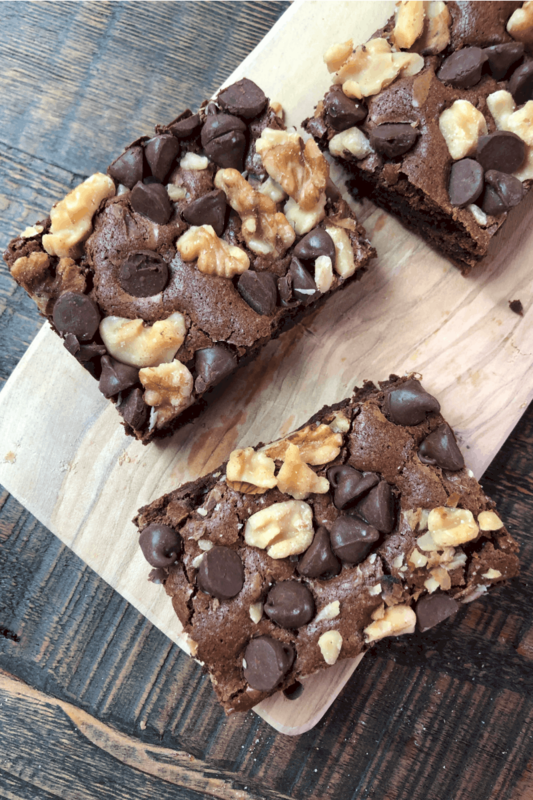 Those chocolate chips and walnuts bake into the top of these brownies, giving them a visually appealing look and a pretty good all-around tasty brownie in the end. 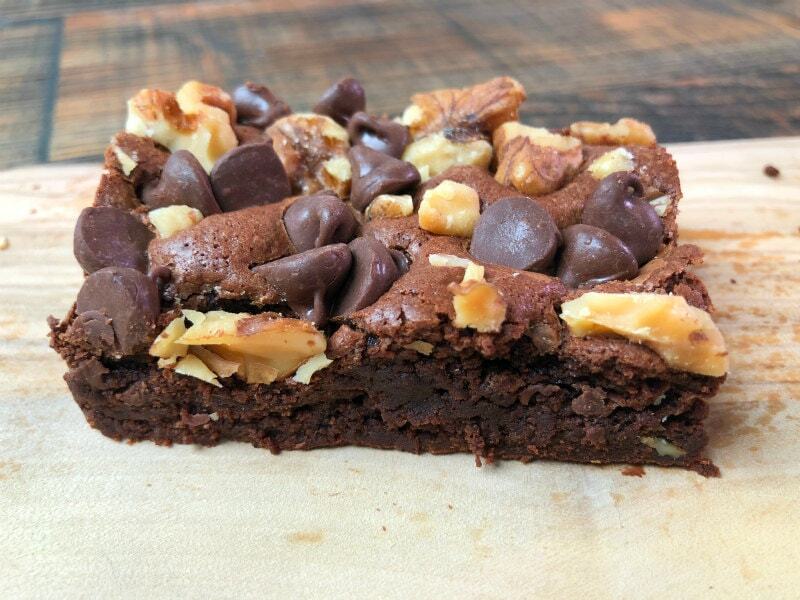 These are the kind of brownies that are good for sharing. Bring them to a party. Put them on the dessert table. And watch them disappear! 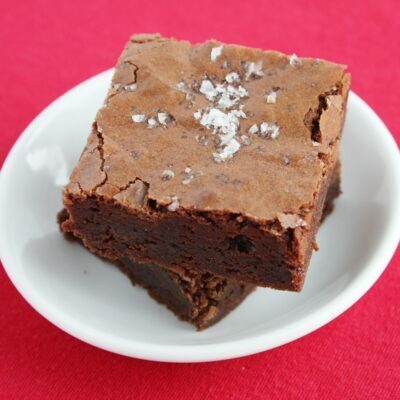 Store cut brownie squares in an airtight container at room temperature; they’re best eaten within 1 to 2 days. You can wrap the whole pan, uncut and well wrapped in plastic, and that will help them stay fresher longer. 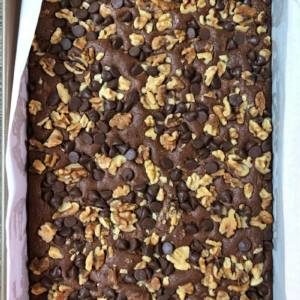 A wrapped pan of brownies will keep at room temperature for up to 4 days, or in the freezer up to 3 months. Cut into squares before serving. You can leave the walnuts out of this recipe, if you’d like. They’ll be thinner and a little more dense. But they’ll still taste good! 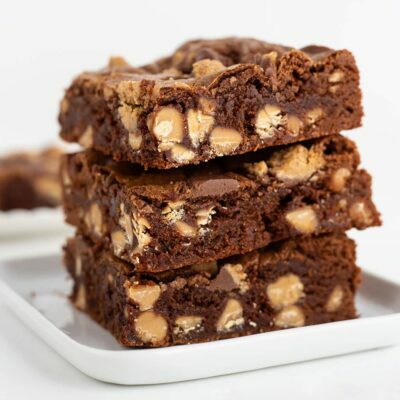 You can also substitute almonds, pistachios, macadamia nuts, pecans or peanuts in these brownies. 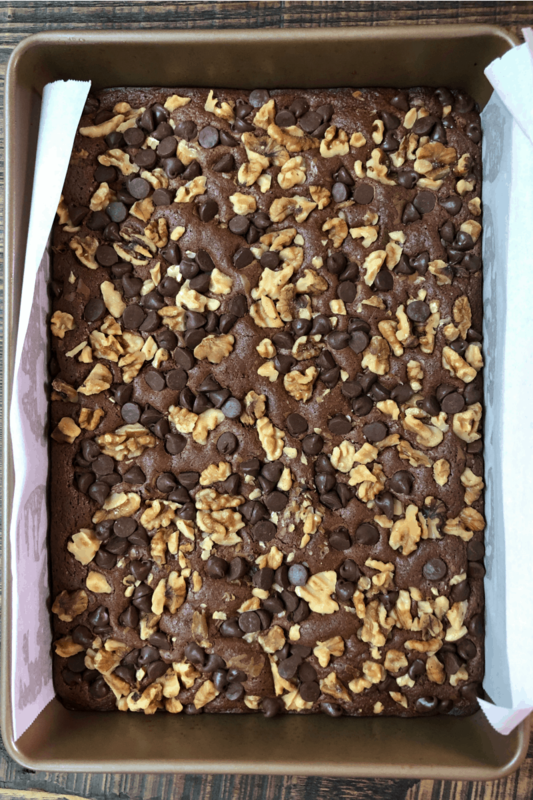 All will add crunch and flavor and make these brownies taste great! How long do walnuts last? I make a habit of storing any kind of nuts in the freezer, where they’ll last the longest. Generally, if you plan to use the walnuts you’ve just purchased from the store right away then you can store them at room temperature and use them in 2 to 4 weeks. If you’d like your walnuts to last for 6 months or longer, store them in the refrigerator (usually good for 6 to 9 months). Walnuts that are properly stored in the freezer can last for about 18 months. Taste and smell a shelled walnut before using. If it tastes sour or bitter, it has become rancid and should be thrown out. If it smells fishy, toss it. Some stores have bulk bins of walnuts so you can dish out what you need and just buy a needed amount. Do the taste test on one of the walnuts in the bin before buying. 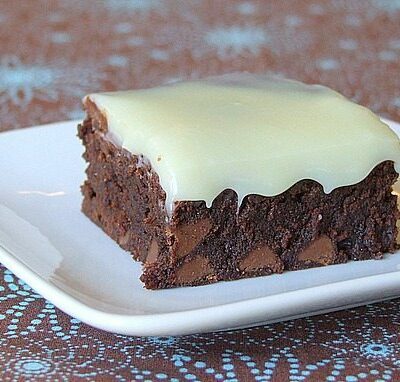 Very chocolatey brownies studded with chocolate chips and walnuts. Preheat the oven to 350 degrees F. Spray a 9x13-inch pan with nonstick spray and then line it with parchment paper, allowing enough overhand on the long side to lift the brownies from the pan. Place the butter and chocolates in a small saucepan and cook, stirring, over the lowest possible heat until melted, 3 to 5 minutes. Set aside to cool. In a large mixing bowl, use a whisk to combine the sugar, eggs and vanilla, Add the cooled chocolate mixture and whisk until just combined. In a separate bowl, stir together the flour, baking powder and salt. Stir into the wet ingredients until there are no white streaks. Scrape the batter into the prepared pan and sprinkle with the nuts and the chocolate chips. Transfer to the oven and bake until your kitchen smells like chocolate and a toothpick inserted into the center comes out clean, 30 to 35 minutes. Set aside to cool to room temperature, then cover and refrigerate. When the brownies are fully cooled, cut into 24 squares. 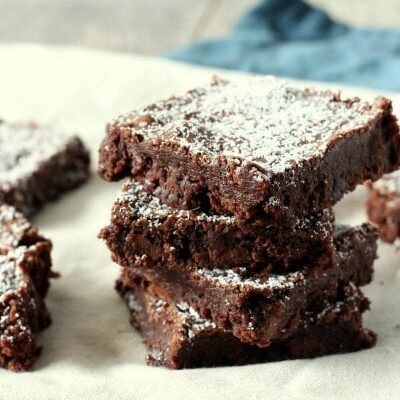 These brownies are so chewy and delicious! We couldn’t get enough of them…I’ll have to double it next time! Looks so delicious! 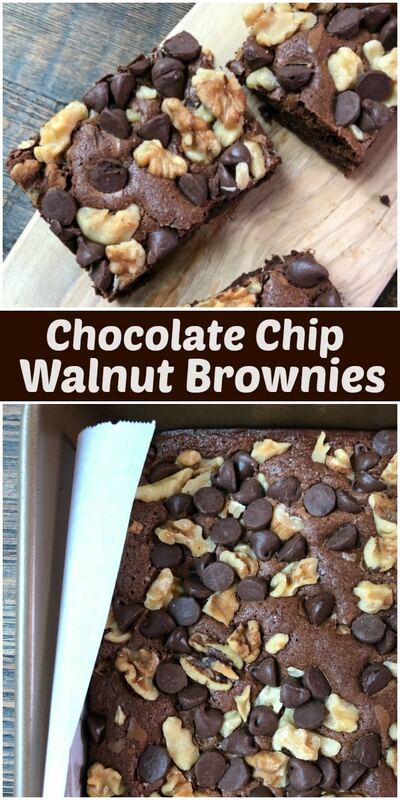 I love walnut in brownies! My kids love these! We omitted the walnuts and doubled up on the chocolate chips! YUM! 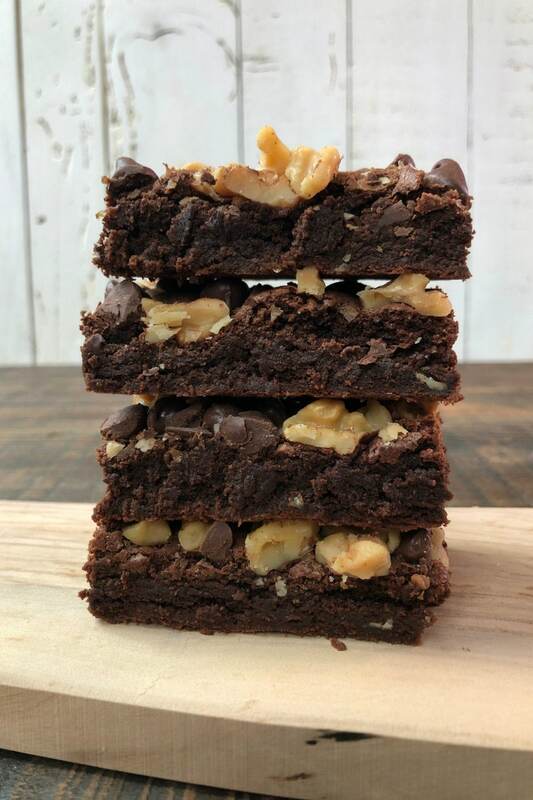 Amazing Chocolate Chip Walnut Brownies!!! My kids would love these. these are the yummiest! I could eat them every day! These brownies are heavenly!! Love the addition of the walnuts.